The settings that will be used by the GDPR Exchange job have to be set here. Select the GDPR database, that you have previously configured on GDPR ⇒ Settings ⇒ Databases page (in our case it is database “TechArrowDB”), from the dropdown list. This selected database will be used by the GDPR Exchange job. The job will store here the metadata during the synchronization process. Pick the Index zone that will be assigned to the Exchange groups/servers by the GDPR Exchange job from the dropdown list. If you want to configure a new one, navigate to GDPR ⇒ Settings ⇒ Index zones. Then enter the EWS URL, PowerShell URL and select the PowerShell authentication from the dropdown list. 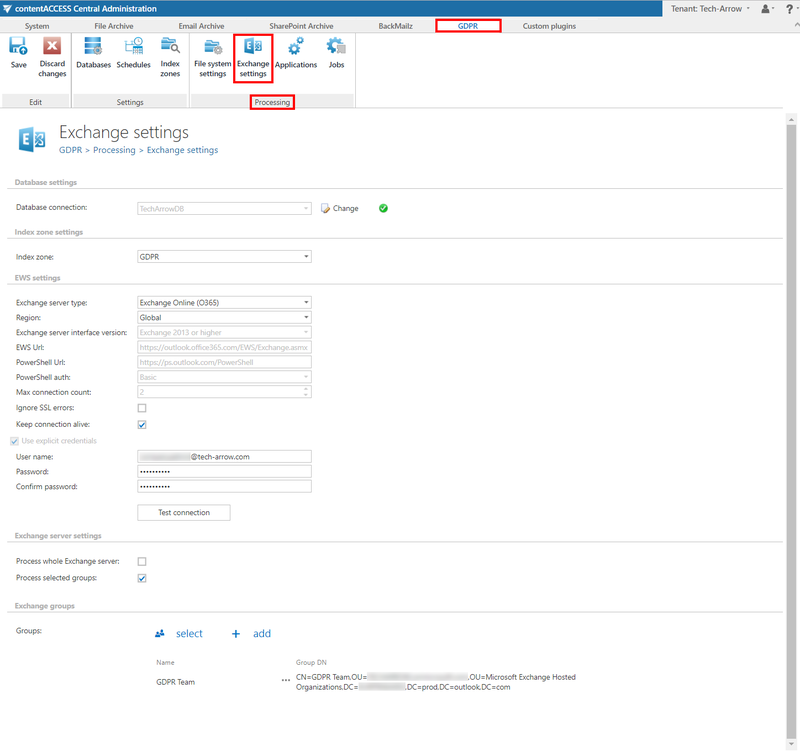 These data must be requested from the email provider you are using (the configuration properties are the same for On-premise and Hosted Exchange). Keep connection alive: If this option is turned on, then the connection between contentACCESS and the Exchange server is cached, which increases the performance. If the Exchange is load balanced, some requests can land on another Exchange and therefore cause errors in contentACCESS. In these cases, unchecking the keep alive option will destroy the connection after each request and will rebuild it on the next request. Important!!! The user set under Exchange connections must have a full access to the mailbox(es) that he/she would like to process. Here the user may select if he would like to process the whole Exchange server or just selected groups. This section will appear only if the user checked the option Process selected groups in the previous section. The groups to be processed may be added by clicking on select and then picking some groups from the Exchange server, or by clicking on add and then writing the name of the group.